Localization is a very important aspect in every content management. In Pimcore localization can be centrally configured and has influence on multiple aspects within the system. Bottom line is that using Pimcore in a multi language mode is pretty easy for users and developers. Pimcore takes care of all technical aspects and by doing so follows the ZF patterns. Pimcore has different sets of languages/locales and translations for the back end (CMS) and front end (website). This allows you to have the user interface of Pimcore in different languages than the website. You need to be aware of this when requesting the current and available locales, as they are different depending on the context. If a user is saving an object in Pimcore which is set to English, the current locale is different then when a visitor on your French website triggers a save action. Fallback language for each language: if defined, Pimcore returns values from fallback language if primary language has no values set. 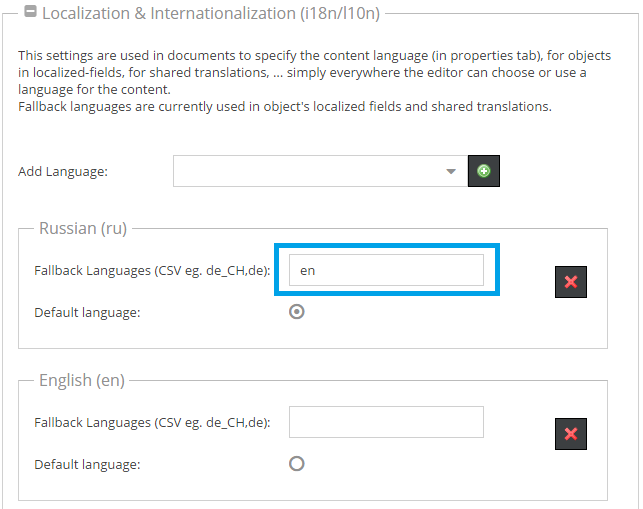 Pimcore backend UI localization is independent from content localization but works similar to Shared Translations. Basically every text in Pimcore backend is translatable, but there are two different sources for translations - Pimcore system translations and project specific translations. This covers all labels and texts within Pimcore that ship with Pimcore installation package. Here the standard language English is maintained by the core team. In addition to that, everybody can join the Pimcore translation project to add system translations in additional languages. With every Pimcore release, newly added translations are added to the Pimcore installation package. System translations can be overwritten by Admin Translations.